You'd think someone would have said "Release the Kraken" on Supernatural this week, right? 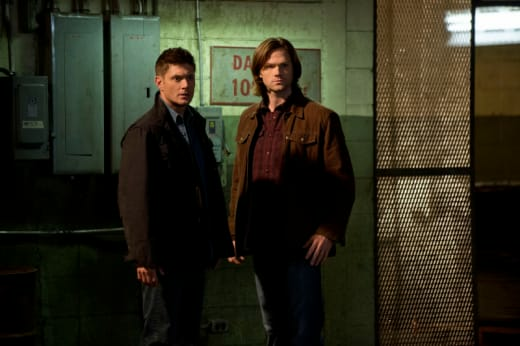 Sam and Dean were back on the hunt for the strange and weird, leading them to a potential zombie case that turned out to be a little more divine than dead. Rather, "Remember the Titans" spun a classic Greek myth with a Supernatural twist. As legend had it, Prometheus was the Titan who stole fire for humans, allowing them to advance and become civilized. Zeus got pissed and punished him to eternal torment, causing him to die over and over again... except Zeus lost him and Sam and Dean found him. And yet, over time Prometheus gained Jason Bourne fighting skills complete with amnesia, along with a seven-year old son suffering the same death curse. Not exactly the best traits to pass on. What better way to reverse the curse than summon Zeus himself? While Liam Neeson didn't grace the screen, Supernatural's Zeus still had a certain level of screen presence that was both menacing and powerful. It was fun seeing the blue lighting bolts zap everyone around. And while the demons and angels have always played at the forefront of being more on the top tier of otherworldly beings, it did make me think about the power of Zeus. Would it really be that easy to take him out? Most incarnations of the Greek god have been pretty all powerful, so I wasn't entirely sure Sam and Dean could finish the job. In a way, they merely facilitated the victory through the actions of Prometheus and Artemis. I loved Sam trash talking Artemis and calling out her love tryst with Prometheus. It was a bold move that got the brothers thrown around a bit (kind of fun to watch), while getting Artemis to quit following her father's orders. Dean's facial expressions were spot on hilarious. Each time Sam said something to Artemis, Dean would switch from frown to smirk to wide eyes, all while being restrained against the wall. However, despite the boy's mother causing Prometheus to get hurt even more because she freed Zeus (c'mon, did she really think Zeus was a nice guy? ), the curse was ended when Prometheus gave his own life for a final time. It really brings up Prometheus' point about saving the world only meaning something when he could save his son. It was certainly something reflecting of Sam and Dean's predicaments in saving the world themselves. I'm assuming Zeus wasn't defeated because of his disappearing act, but it makes me wonder what the repercussions of fighting him might be, if any at all. Not exactly my favorite bad guy the brothers have fought, but it worked out and was something different from what we usually witness. Will we perhaps see even more Greek gods in the future? 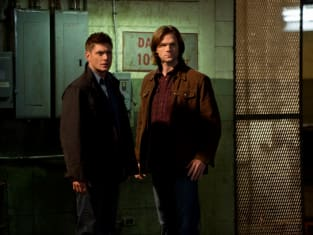 But on top of the case of the week, I enjoyed Sam and Dean's final comments about their own mission to save the world; a la closing the Gates of Hell. Sam acknowledging that he was having doubts about surviving the God trials (he's spitting up a lot more blood), while Dean was there to tell him to quit being emo and be positive. At least they weren't worried about trust. Yet, it was Dean's prayer to Castiel (seriously, where is that angel?) that was a great monologue about looking out for his little brother. It was nice seeing him get emotional, hoping his friend might appear to help, and then really shaking his head as to what might be going on. We haven't heard a peep out of Crowley, Naomi or Castiel in quite some time. This was a much more interesting episode than last week's "Man's Best Friend with Benefits," and although not mind blowing in concept, it was still an good take on Greek mythology, keeping the brothers together and driving forward on their quest to save the world. After all, Sam and Dean are legacies. No big deal.